No, the fourth planet from the sun did not attack Topps' intellectual property. Rather, the Topps Company continued its recent spate of trademark application filings with its latest: the mark “Mars Attacks" to be used with skins for mobile phones, MP3 players and tablet computers. 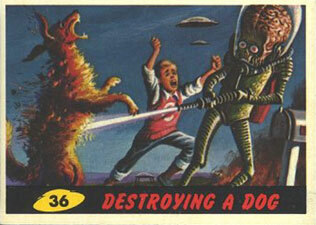 Mars Attacks was a trading card series released in the 1962 that described an invasion of Earth by sinister Martians. The graphic depictions, created a stir on school playgrounds. Today, Mars Attacks remains one of the most popular and recognizable entertainment card brands in the hobby. Topps released additional merchandise based on Mars Attacks in more recent years including new cards and comic books. Tim Burton released a film based on the series in 1996. The trademark hints that Topps may be embarking on another release of “Mars Attacks" merchandise. Fingers crossed that there are skins like this.